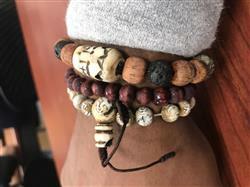 A unique and exclusive men's bracelet made with a skull bead hand carved from water buffalo bone, Thai rosewood, lava rock, and prehistoric mastodon beads. This distinctive combination makes for a strong design and a handsome bracelet. Associated with the heart chakra, rosewood is known for its compassionate and healing energies. Lava rock is known for its grounding properties and is wonderful for calming the emotions. Because it comes from raw energy, it’s considered to be a stone of rebirth and shedding unneeded layers of emotional attachment. It is created from the center of the Earth and therefore is fantastic for stabilizing and grounding the root chakra. A note about bone beads: Tibetan nomadic life is hard, and in the cold there is little to eat. Water buffalo is a main staple in Nepal and Tibet and when an animal is used for food nothing is wasted. These amazing bone beads are handmade by artisans who recycle and reuse everything in daily life and spiritual practice. The skull in Buddhism is a symbol of impermanence and is a powerful reminder to be here now! Bone beads also serve as a reminder to live in the present moment; because nothing is permanent, everything is possible. Bracelet measures approximately 6-7 inches around on a durable, stretchy cord. Rosewood and lava rock beads are 10mm, mastodon beads are about 12mm long and 10mm wide. Skull bead measures approximately 20mm long and 15mm wide. I really enjoyed the bracelets. Besides them being stylish they are somewhat of a conversation piece. I will most definitely shop with you guys again. It was purchased as a gift and he absolutely loves it. I love this piece – – very well-made and so organic. Also a wonderful spiritual reminder. I usually wear a 7 inch bracelet but this fits just fine – – a little loose which I like. I think it would fit anyone from a 7 to 8 inch plus. Very neutral colors so goes with everything. Looks just like the picture.